• The machine is having round Tank with 12 head filling. 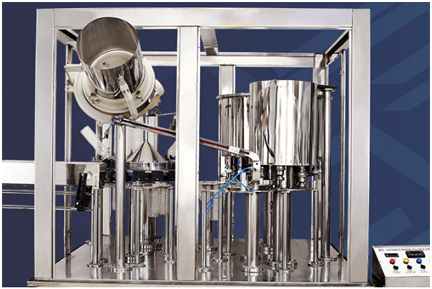 • The filling valves are specially designed to fill Juice (HOT) from 200 ml to 2000 ml. • The machine is provided with 12 head rinsing nozzle with twelve set of catcher for holding bottle which also allows the bottle to get washed from inside. • The machine is having 4 sets of special magnetic torque capper to tighten the cap of your mentioned size. The machine is suitable for filling any type of liquid, which has free flow density. As this machine is complete mechanical operated no compressor is required. Cap feeder, which has a capacity of approx 2000 - 2400 caps. • 15 feet Out feed motorized Conveyor for unloading the filled bottle with Inspection Board and Shrinking machine in line. Machine is provided with Variable Speed Controller. In Brief: A complete mechanical machine with no pneumatic operation and no solenoid filling operation. Juice level is maintained by vein tube system. • Shrink Tunnel: 4.2 kW 440 VAC.